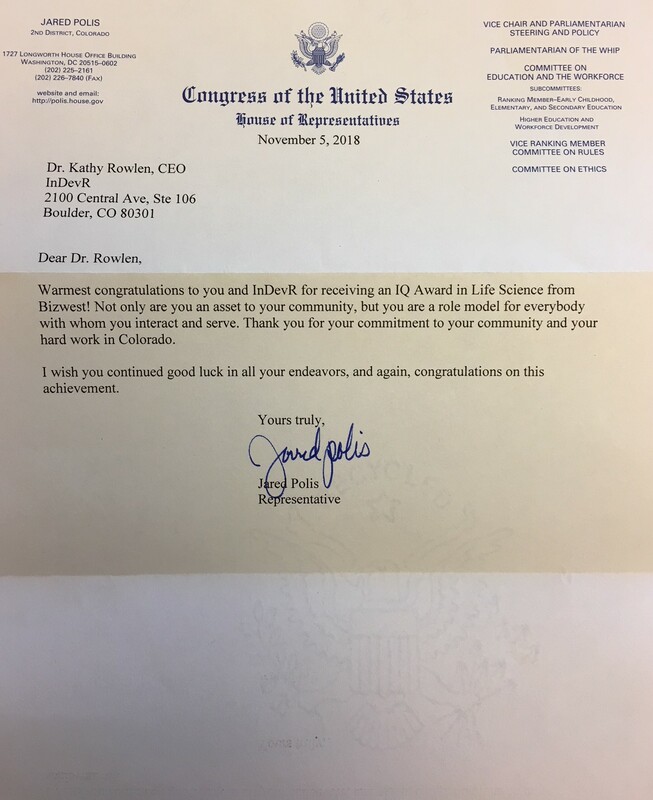 BOULDER (11/8/18) — InDevR announced today that it will pursue proof of concept development for new VaxArray potency assays for measles (M) and rubella vaccines sponsored by the Bill & Melinda Gates Foundation. The long-term objective is to create in vitro measles and rubella potency assays in order to deliver high quality MR vaccines to market faster and with lower production costs. The project will leverage the multiplexed VaxArray platform, which was first developed and validated for more efficient potency testing of influenza vaccines. Accurate measurement of vaccine “potency” is critical because it allows vaccine producers to package just the right amount of the active ingredient. Under-filling can result in a sub-potent vaccine that does not protect the patient and over-filling can cause a safety issue – both cases result in unacceptable product. Measles and rubella (“German Measles”) are highly contagious diseases that have significant health impact around the world. According to the Measles and Rubella Initiative (https://measlesrubellainitiative.org/learn/the-problem/), before the year 2000 over a half million children died each year from measles and associated complications. This disease can be prevented by well-proven vaccines. In order to deliver the vaccine to all those in need around the globe, it would be beneficial to streamline the vaccine manufacturing process. Initial product development of the VaxArray platform was sponsored as part of the Department of Health and Human Services’ inter-agency Influenza Vaccine Improvement Initiative. Specifically, product development for influenza vaccines was supported by a Small Business Innovation Research grant R44AI102318 through the National Institute of Allergy and Infectious Diseases, which is part of the National Institutes of Health (NIH). BOULDER (10/8/18) — The development of vaccines against potentially pandemic influenza strains is a critical component of the global response to an influenza pandemic. However, the tests needed to determine the potency of pandemic vaccines often represent a bottleneck delivering those vaccines when they can be most effective. Immediate access to a potency assay for monitoring of immunogenic HA concentrations would streamline the development, production, release, and ongoing stability monitoring of pandemic vaccines. InDevR’s recent publication describes the development and performance of the VaxArray Influenza Pandemic HA potency assay for vaccines containing H5, H7, and H9 subtypes: Byrne-Nash, R. T. et al. 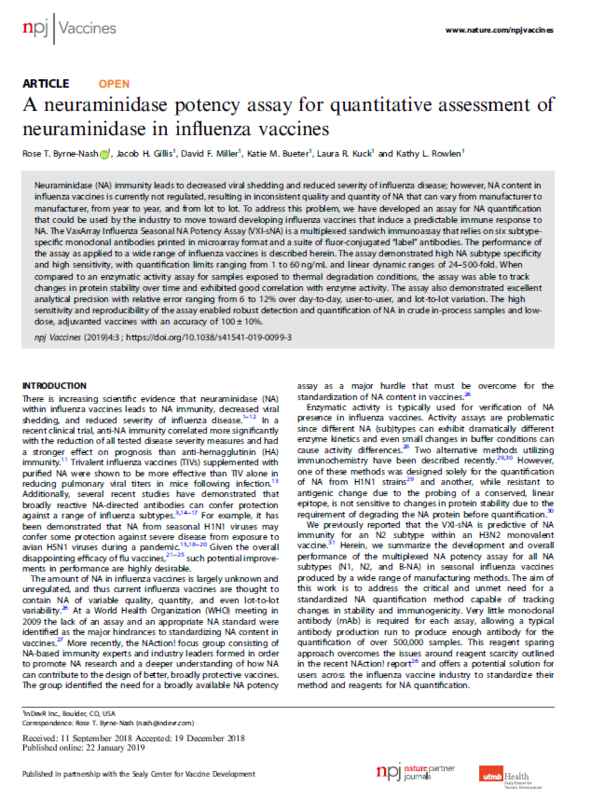 VaxArray potency assay for rapid assessment of “pandemic” influenza vaccines. npj Vaccines https://doi.org/10.1038/s41541-018-0080-6 (2018). “With the 100th year anniversary since the 1918 influenza pandemic, there has been much discussion at every level of government and within the global vaccine industry about the gaps that remain in our ability to rapidly respond to deadly pandemic. We have addressed a critical gap with this new potency test. The VaxArray platform represents a breakthrough that could significantly streamline delivery of safe and efficacious influenza vaccines in the event of a pandemic,” said InDevR’s CEO Dr. Kathy Rowlen. The assay demonstrated high sensitivity, accuracy, precision, and detection of a large panel of influenza viruses with pandemic potential spanning 16 years of antigenic drift, including the most recent pre-pandemic vaccine being developed against the “5th wave” A/H7N9 virus. The assay was also shown to be compatible with low dose and adjuvanted vaccines as well as upstream crude in-process samples, which would allow manufacturers to use the test to optimize yield. The VaxArray system outperformed the current labor- intensive assay for influenza vaccine potency, SRID, in terms of sample-to-result time (2 hours versus 2 days), limit of detection, sensitivity, and compatibility with crude and adjuvanted samples. This work was sponsored as part of the Department of Health and Human Services’ inter-agency Influenza Vaccine Improvement Initiative. Specifically, product development was supported by a Small Business Innovation Research grant R44AI102318 through the National Institute of Allergy and Infectious Diseases, which is part of the National Institutes of Health (NIH). The content is solely the responsibility of the authors and does not necessarily represent the official views of the NIH.